While these events were pre-planned, until Tuesday the city police had not made any official announcements about any traffic diversions on the stretch. 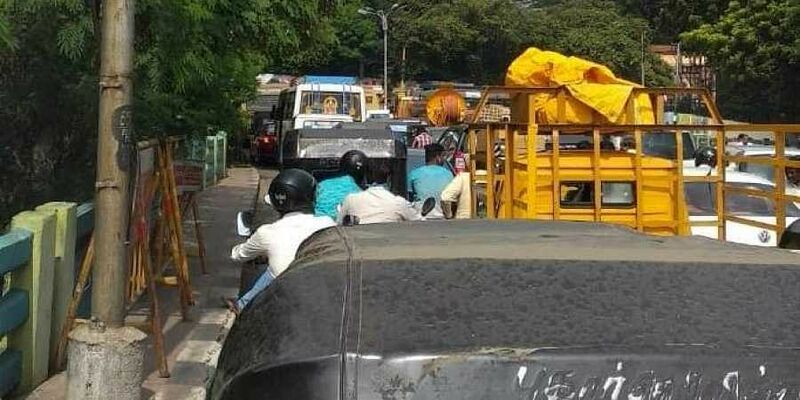 CHENNAI: Chennaiites had a tough time on Wednesday morning as heavy traffic piled up in and around Triplicane and other areas in the vicinity of Marina Beach. The Chennai Police diverted traffic from Kamarajar Salai, also known as Marina Beach Road, from 10 am today after many political leaders, including Chief Minister Edappadi Palaniswami and RK Nagar MLA TTV Dhinakaran, took out processions in view of the second death anniversary of former Chief Minister J Jayalalithaa. While these events were preplanned, until Tuesday the city police did not announce about any traffic diversions in the stretch. But this morning, almost the entire Kamarajar Salai was blocked for traffic and the motorists were diverted into various other roads resulting in near total chaos on the roads. The traffic piled up in Triplicane, Ice House, Egmore and areas around the Central Railway station. Some of the motorists said it took them one-and-a-half hours to cover certain stretches which on a usual day takes them only 20 minutes. This reporter saw three ambulances headed to the Rajiv Gandhi Government General Hospital stuck in the traffic pile-up. Making matters worse, very few traffic police personnel were seen on the roads to regulate the traffic jams. At many junctions, motorists coming from all four directions were caught in the logjam with no way out. Vehicles, including MTC buses, were parked in a zig-zag manner at the Dr Natesan Road junction at Triplicane. Almost all the streets in Triplicane were filled with motorists trying to find a way out, but most were stranded in the same spot for long. Vehicles on the Gandhi - Irwin bridge at Egmore were stuck in a jam for more than 30 minutes. The vehicles were piled up on either side from Chennai Central to Kilpauk Medical College and Hospital. Only two police personnel were posted near the city police commissioner's office to regulate the traffic. At around 10.40 am, Chief Minister Edappadi K Palaniswami and deputy chief minister and most of the State ministers in black shirts led a silent procession from Anna Salai through Walajah Road and reached the memorial of late chief minister J Jayalalithaa at Marina Beach. Both leaders paid floral tributes to the late leader and later Panneerselvam read out pledges to lead AIADMK on a victorious path by winning all future elections and continuing her welfare schemes. At 11.45 am Palaniswami and Panneerselvam left the memorial. At around 12.30 pm, Amma Makkal Munnetra Kazhagam deputy general secretary TTV Dhinakaran led another silent procession to the Jaya memorial.